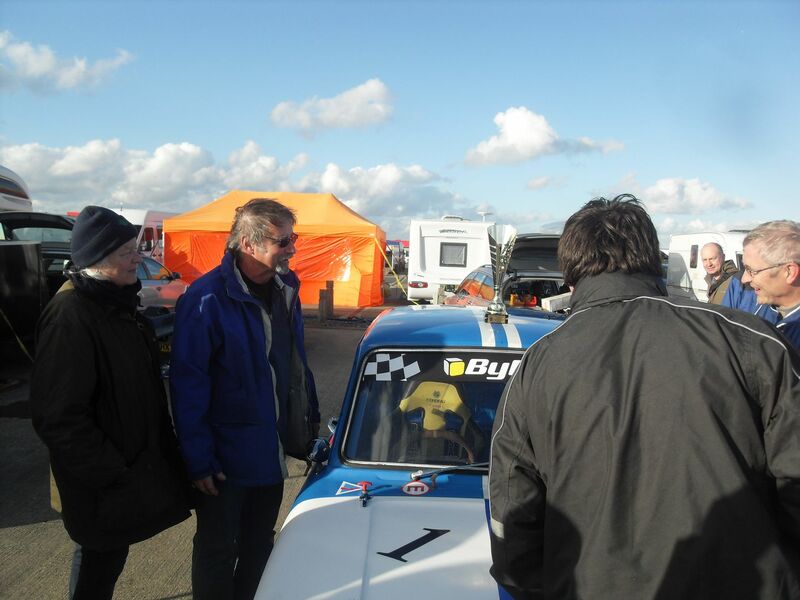 Here is a link to Bob Bullen's in car video from an Anglia at the recent Cadwell meeting. So what happened at Oulton Park today ? Simon - not classified in Race 1 or 2 after qualifying 8th?? Something about some cars not making the restarted race?? 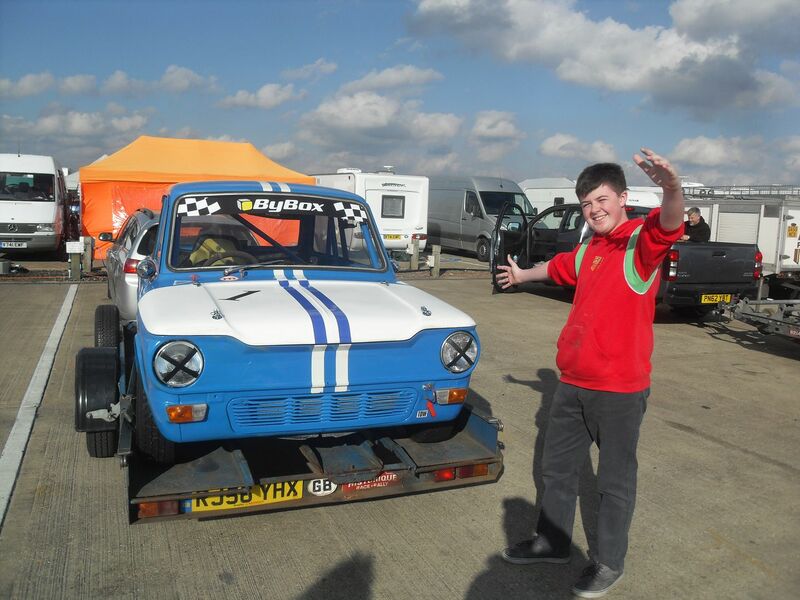 2 class E wins for Adrian according to MST Timing.. Well done Adrian. Not a good day at the office for either me or Steve Platts. 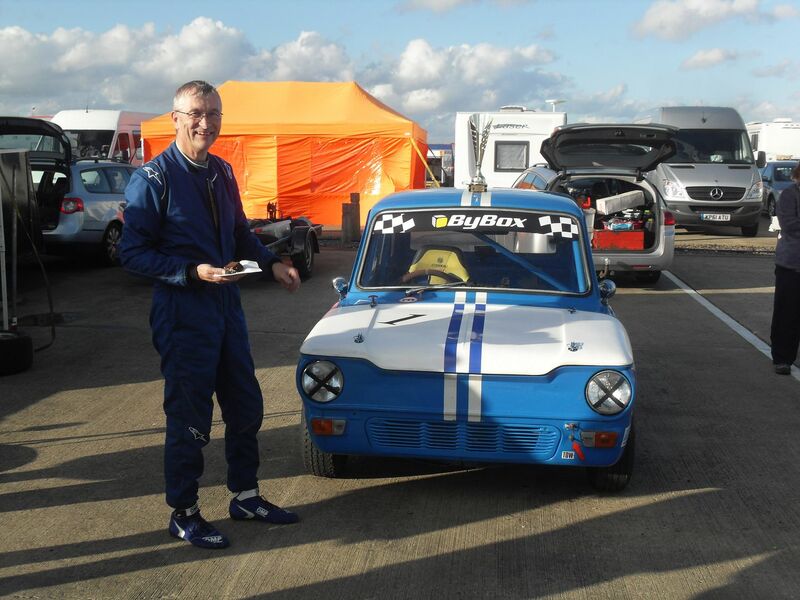 I got edged off the track at the first corner and was collected in the front driver's wing by a Mustang as I came back onto the circuit at 90 degrees, just about come to a halt and hit again on the rear passenger side very hard by a Cortina. So lots of damage - we left in time to get home around six and have removed the engine and gearbox and a few other bent bits. More details to follow when we have done more analysis but we will need a lot of help to get it out in time for the Silverstone finals. Steve was leading the class but had engine problems and broke a rod. 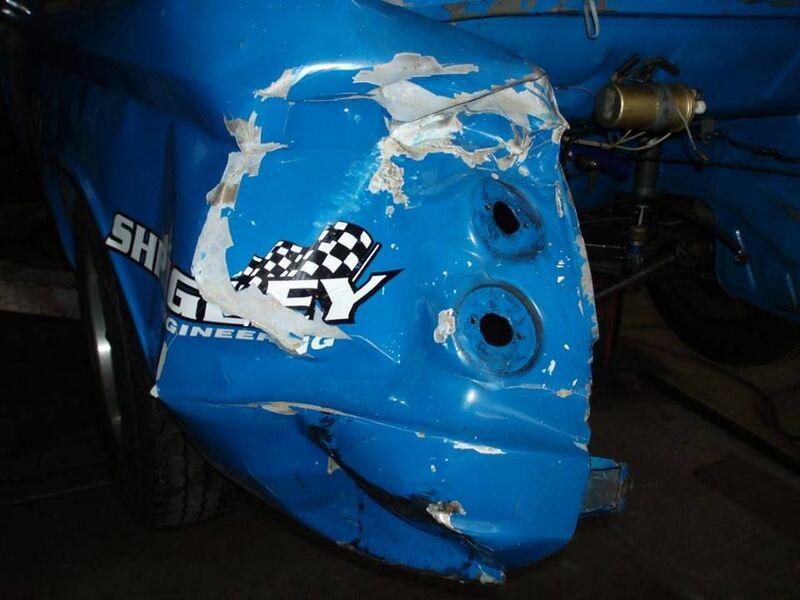 Sorry to hear that Simon... final analysis - no one hurt.. all that really matters. Hope you can get to Silverstone.. We are planning a day trip again this year so hope you're there competing .. looks like the Sunday will have 2 races and quali .. but will be sad not to see Formula Fords/Juniors... never mind..
Simon- having seen the video from the mini (which was behind you, obviously ), you did very well to escape serious injury and keep two(ish) corners on the car... back into the middle of the track sideways after the first corner of the first lap looked pretty hairy! Have you got a link to the video Frank? 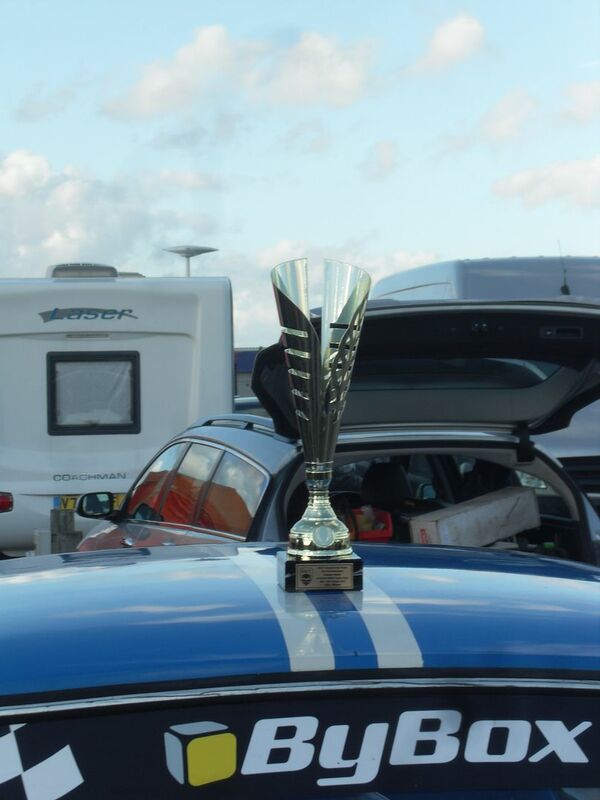 Out of interest, what are driving standards generally like in the HSCC series? It's a series that I'd love to take part in one day but I'd be put off by the fact that there always seems to be multiple incidents with contact and usually at least one car that, if it were a road car, would be written off by insurers. Call me biased but I'm not actually referring to any imps here, seems to be the blue oval lot quite often. This year in particular I've been lucky enough to attend quite a few circuit events, and driving standards across the various formulae varies greatly! Not a pleasant watch - be warned. The last sequence, with a white Mustang, makes it look like it could have been even worse. Very glad it wasn't. Overseas contact, Sweden. -69 Cali (998), 2 -64 Imps in need of "some" work. Life is full of solutions waiting to be found. Location: 25 km s.w. of Stockholm, Sweden (overseas contact). OUCH - Not pleasant as you say - much damage done ? Lots to my car, a fair bit to the red Mustang and the Cortina that ran into the back of me might need a shell. But no-one hurt - just a couple of bruises. Cars can be replaced, finances permitting. SimonBenoy wrote: Lots to my car, a fair bit to the red Mustang and the Cortina that ran into the back of me might need a shell. But no-one hurt - just a couple of bruises. Cars can be replaced, finances permitting. Double ouch , from the vid inside it didnt seem that bad , what bits are you after ? 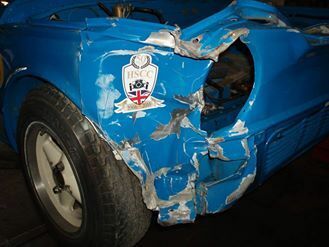 It was the hit from the Cortina that did the most damage - might have been able to pull out the front wing enough to run. I think I am ok for bits, thanks. Panels were an issue initially, but I think we are getting there. The rest is easier, it all depends on what Mike can do. The damage list does bear heavily on the rear damage and from an angle resulting in the damge to mountings etc.. As Lars says, you were lucky that the white Mustang didn't catch you as well. Hope Steve gets his car re-engined for finals day as well. Glad you weren't hurt, Simon. And I hope you get your car back out for Silverstone. Steve too. I'm hoping to come and spectate. 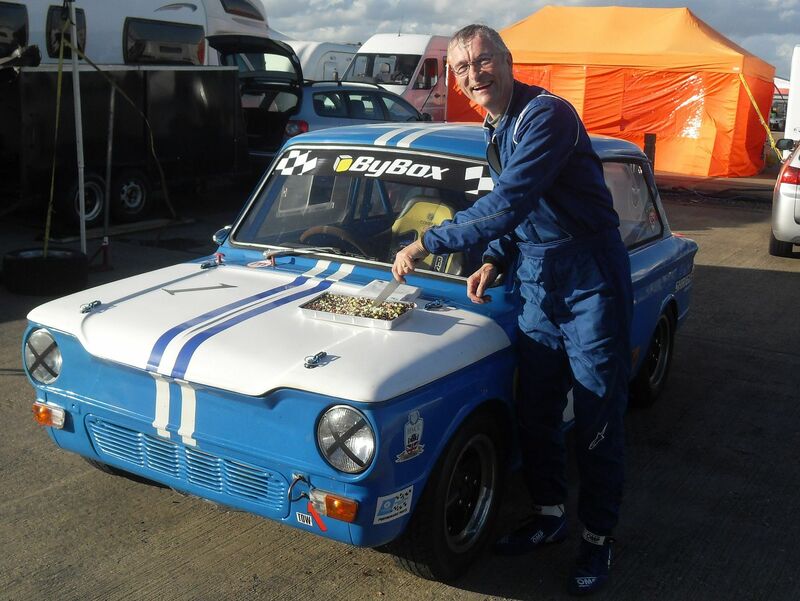 Well, 4 Imps entered for the Silverstone finals - Steve Platts, Shaun Hazlewood, David Heale and myself - all racing on Sunday with qualifying first thing, first race late morning and second race mid afternoon. Due to outstanding work by Mike Hanna and help from many others pitching in, I have got my car back together after the accident at Oulton Park, though I will be running my 998 due to some damage to the 1150. Hope to see some hardy annuals there, though the weather doesn't look too promising at the moment - might take cover in the allocated garages if you can't find us in the usual area. Glad to see Mike Hannas' efforts came to a timely end. Good luck now to you and other racers and supporting friends. Understeering and going wide I suppose? Congratulations Simon, very well deserved. Good to see so many Imps and their support. And thanks for the cake. 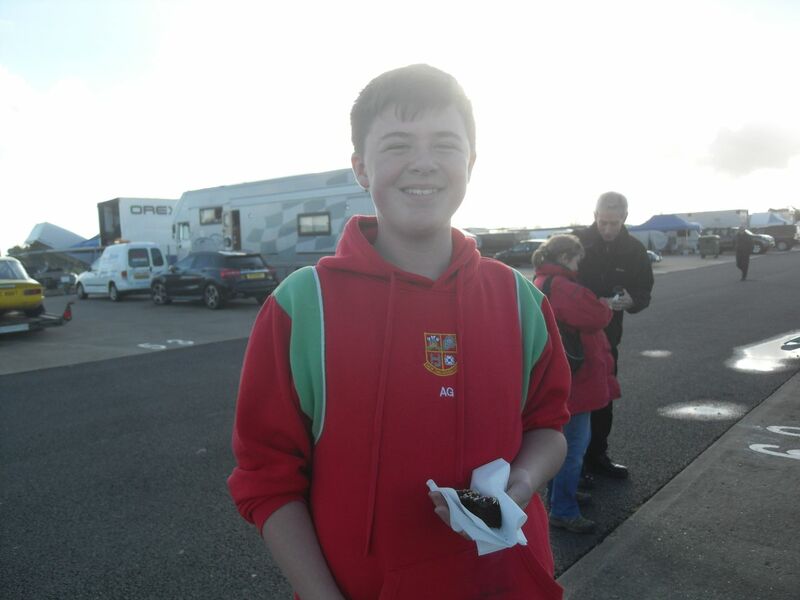 Hi Colin - yes, the race 1 result was enough, championship secured, got second in class behind David Heale in race 2. Sadly, Colin's gearbox cried enough on lap 1 after losing top gear in race 1 and Steve had as issue with his drive train, something went bang and didn't work any more. 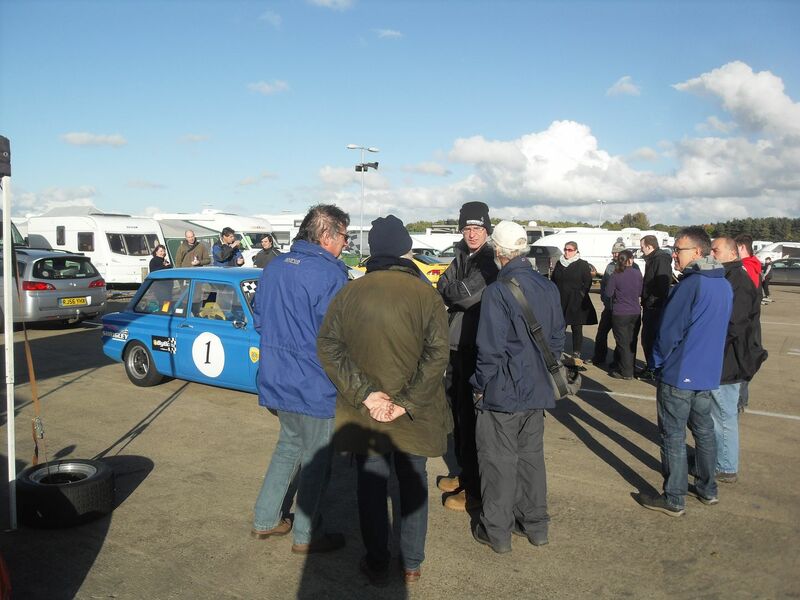 Great to see lots of Impers at Silverstone, many thanks for your support for the racers - we are easily the best supported cars at the meeting. I think most people got a sliver of cake - must buy a bigger one next year So many people helped to get my car to Silverstone today, the pressure was on to deliver, fortunately it all worked out on the day. My replacement air filter arrived at about 10:30 on Saturday to replace the original replacement which was the wrong size! Hi JayPea - great photos, as always - thanks for posting, need a like button! Congratulations Simon, a great result, especially after such a hectic rebuild. Well done! And thanks to all the other Imp racers too for providing us with such great entertainment through the season. Well done on your championship win. CONGRATULATIONS Simon.. unfortunately we had a terrible dilema to resolve today - a day 200 mile MGF run at pace along the beautiful Elan Valley to Aberystwyth or a cold/wet Silverstone .. so we missed your triumph. Hope we are there next year to witness your triple crown ! 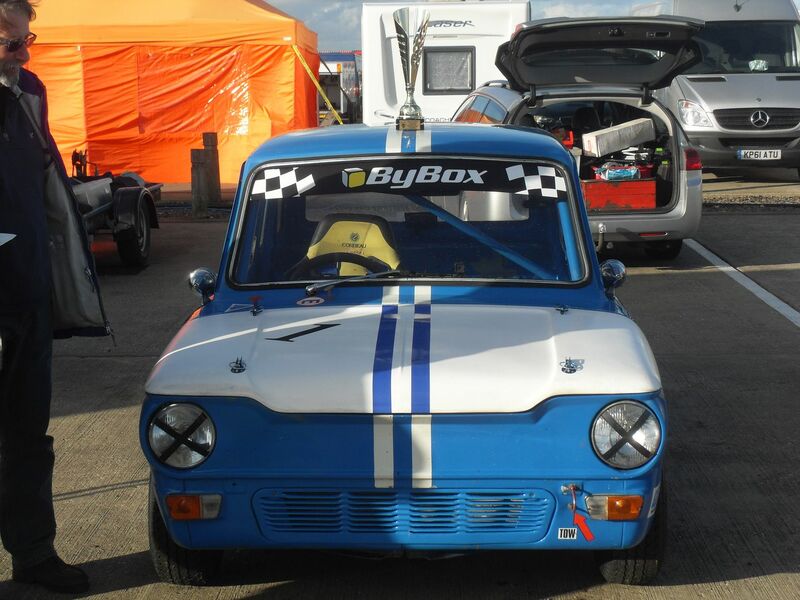 A fabulous weekend at Silverstone to watch Simon Benoy lift the trophy as Championship winner,a great achievement not only from Simon and crew but for Mike Hanna seeing all his good work in repairing the car after the incident at Oulton Park,well done to all concerned,great to see so many Imp Club members out supporting the Imps. well done Simon great result. Hats off to Mike for the car repair. Excellent, Simon! Very well done to your helpers and supporters too. Taking my hat off for all involved in the resurrection to clinch the championship! Fantastic news. Congratulations Simon and very well done to your support team, especially after the accident. And well done to all the Imp competitors.